Rhaetica? Nec cellis ideo contende Falernis. 100 aut tantum fluere aut totidem durare per annos. transierim, Rhodia, et tumidis, Bumaste, racemis. nosse, quot Ionii veniant ad litora fluctus. Leaps, and foams and flashes about! Nothing Italian is ever closely defined. I have a Neapolitan cookbook from 1926 which is filled with amazing local recipes, but none of the amounts to use or cooking times are quantified (“prendi un bel pollastro . . .” take a nice-sized chicken . . . cook it for a long time in a hot oven . . .) . . .
Real pizza is made with buffalo mozzarella and the sauce of tomatoes ripened until they are very sweet, and fresh leaves of basil, but, in my home city, I can go to a machine on the street which will serve me a pizza from a slot in its side in which the ingredients are all semi-artificial, and for which one of the toppings is pineapple. And, if you should ever try to make “spaghetti all’ aglio, olio e pepperoncino” (with garlic, oil, and hot pepper)—good luck trying to figure out when to put the hot peppers in, or how hot to make the oil. Yet my friend from the Abruzzo does it all without a second thought. So when Mario Soldati, a writer whose concerns were political and social, hardly gastronomic, writes that “wine is the poetry of the earth,” he is expressing a kind of fundamental Italian truth in the manner of the country. In fact, there is a long tradition linking the soil of different places to the wines that are made there. It goes back at least as far as the Romans, but there is good reason to believe it arrived in Italy with the Etruscans—very enigmatic people, the Etruscans, but they apparently did place a high value on making wine. The Roman poet Vergil, on the other hand, we know a lot about, and his first long poem, the Georgics, was dedicated to a revival of Italian agriculture. The second book is all about growing vines, and, you can see that he makes a close link between the wine and where it comes from. There is wonderfully artistic poetry in the Georgics about man and nature, and the relationship of the divine, the natural, and the human. Wine, for Vergil, was a means to link up the spirit of place with the spirit of the people who lived there. The tradition is ancient and strong in Italy. The 17th century poet and scientist, Francesco Redi (known as “L’Aretino”), devotes his long poem about wine to how the stuff from different places has different character. He adores Chianti, and particularly the wines made by the ancestors of our author, Pietro Antinori, in ways that wines from other places don’t (he comes down quite hard on some of them). Our author, Antinori, is not a writer of the class of Vergil or Redi. In both Italian and English, his book is readable, lively, and bit sporadic – it is probably not intended to read like a journal, yet that is what it most resembles. But Antinori is, in his way, a creator of great classics. He invented the “SuperTuscan” wines: These are wines made with a great sense of what the French call “terroir,” a specific place characterized by local aspects. These wines were of a quality that stunned the wine industry when they first came out. I am a “Roman” in my election of what part of Italy I belong to. I feel deeply emotional about the culture of the region of Lazio, and, to Commenditore Antinori, this makes me into a kind of subhuman creature . . . it’s a bit like New York and California . . . anyway, I would gladly give up the bottle of Cesanese del Piglio that I drink with my pajata (a dish made from the intestines of a very young calf while they are still filled with the milk of the mother) in exchange for a half a glass of a SuperTuscan. There is simply nothing like them. In fact, Antinori has given a new meaning to the French idea of “terroir.” Originally, a Sancerre from the Loire had certain specifics that identified it as coming from that region, and that meant ‘terroir.’ Antinori, with his new wines, expanded the definition of “terroir.” These wines had a completely original approach, nothing necessarily to do with local tradition. And they were mind-bendingly delicious, with complexity of nose and taste that few other wines had. It was as if the wine had come to define the place, instead of the other way around. The SuperTuscans redefined not just the Italian wine industry, but set standards for wine around the world—they made us all think about wine differently than we had before. The long-term vision is what Antinori tries to explain in the book. He tells the story of how his company had to separate from a beverages industry partner, because the latter was too worried about the quarterly bottom line. Very gradually and carefully, Antinori grew his company by making great wines, and by expanding to make more of them. The story is well told in the book. More important, at least for this reader, is the way in which Antinori worked closely with his collaborators to create the great wines his company makes. If you care about wine, the story behind the creation of Tignanello or Solaia is well worth learning. There is also much about the long history of the family and building of the wine business. 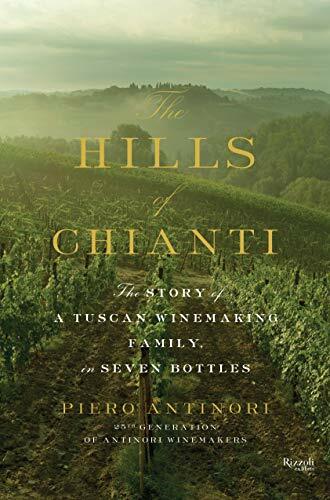 One gets a good sense from the book of the role of Antinori’s family—his three daughters now help him run the business. And though the business now extends across the globe, that sense of family roots in Tuscany, in a certain aesthetic, in specific values that link it to its birthplace, is perhaps the best thing that the book communicates. Andrew Rosenbaum has been a journalist for 20 years and writes for Wine Business International. He lives in France.